This is the story of what is perhaps the biggest eyesore in Nashville, A.K.A the Nathan Bedford Forrest statue on I-65. There is a strip of unusable land where Interstate 65 and the train tracks to the CSX Radnor Yards run parallel between Harding Pl. and Old Hickory Blvd. The owner of the land spoke to city councilmen to get the area rezoned for permission to build a storage facility here, but when nearby residents complained, the city council voted against rezoning. 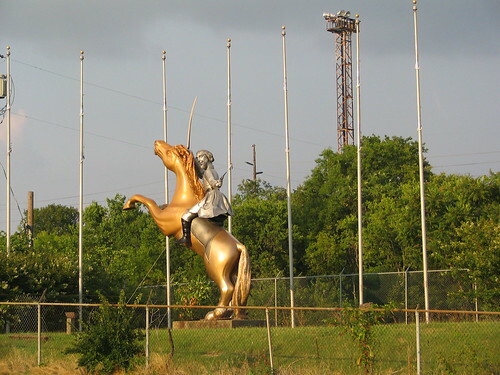 Atop the Bronze horse, is the silverish fiberglass Forrest with a pistol in one hand and sword in the other. He also has an expression that one makes after sitting on a thumb tack. Of course, not everyone hates it. For instance this page is what the creator has to say. Other notes: In the first picture, you see several white poles. These 13 used to each have a confederate flag. Also, in the late 90's, there was a sign which essentially said," Welcome to Nashville: Future home of the ex-Tennessee Oilers" implying that Bud Adams would move the NFL team again to the next city that gave a sweeter deal. In 2002, there was a different sign added which said "Welcome to HistoricNashville site of U.S. Army War Crimes against black southerners @ Ft. Negley 1863." 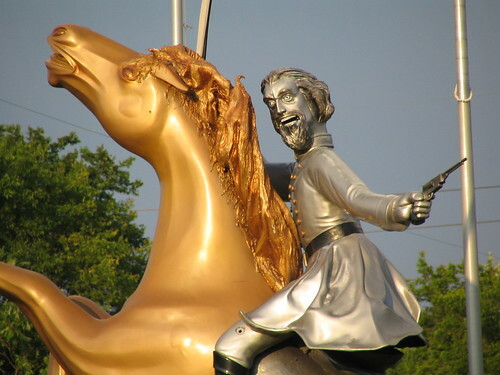 In 2002, the statue was shot at, but the General was missed and only the horse was hit. I don't believe that is a bullet hole in his knee. Finally, in the state of Tennessee, there are more statues and memorials to Forrest, than all three of our U.S. Presidents (Jackson, Polk and Johnson) combined. I was unaware of the zoning problems regarding this statue. Thanks. And thanks for the close-up photos. My understanding is that the odd material for the statue was chosen because spray paint does not adhere to it. Do have confirmation on this? I always felt the city should build a "noise abatement" wall at the edge of the interstate through there. I believe eric is correct, that it has some king of special spray-paint-no-stick surface. I believe there is a rule that if any state rep or senator asks for a spot on the highway to be mowed, it will be by TDOT using inmate help. (usually done to not hide a billboard.) Sen. Douglas Henry makes sure the area in front of this remains mowed. 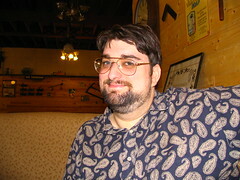 The land owner, a.k.a. "Sir William" (no relation), has been fighting the zoning commission on this land for years, even before building the statue. I think it goes back to when I-65 was built, basically creating a sliver of prime real estate between the railroad and the interstate. Every few years, he would have some huge sign on the property entrance on Hogan Road stating how he was denied access to the land ... blah blah (hard to read the whole tirade at 35 MPH). I heard him on a radio interview once after building the statue. It was, umm, interesting.